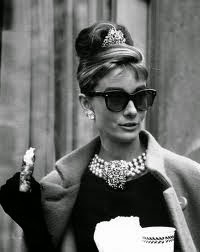 Breakfast at Tiffany's is my favourite movie starring Hollywood's greatest style icons and multi-award winning actress, Audrey Hepburn. 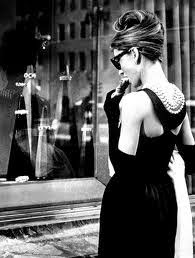 So, one morning, when my husband and I took a trip into Tiffany's in the city, it filled me with great nostalgia. With just one step into Tiffany and Co, Collins Street Melbourne, you get a sense of being transported back into time. 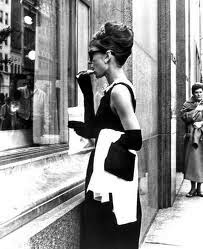 Without, of course, an LBD, croissant and coffee! I was in search for the perfect pair of earrings that I could wear every day, for both day and night. My first choice was a lovely pair of T & Co 1837 circle diamond earrings in 18ct gold. However, once I tried these on, they just didn't suit me, so we ended up perusing the diamond section. For years, I have dreamed of owning a pair of Tiffany diamond earrings. The sales consultant was amazing and incredibly helpful. After trying on several pairs of earrings, I found the perfect ones! It was really very exciting! I chose a pair of diamond earrings set in platinum and the sales consultant informed us that Tiffany & Co choose to set their diamonds in platinum, as it is the best precious metal for bringing out the true beauty of a diamond. 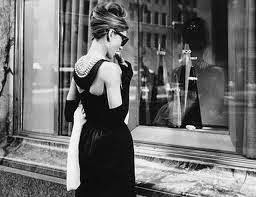 Have you been into a Tiffany & Co store recently? If so, what caught your eye?